What is that behind me…? Thanks to Sian Schiaparelli (@schiaparelli) for this. That’s funny, will be on the look out next time i’m at the PCC & staying away from anyone with a red coat on. Would be ace if you showed your Rolf Harris Saves The World or Carbolic Soap shorts between films at one of your PCC double bills Ed, would be very awesome to see those. I realise that location and cost may prevent some people from getting to the cinema. But can’t you folks at least buy the DVD rather than illegally downloading it??? Dear Edgar. I shall keep torrenting becaus its a perfect way to send huge files too my friends and family. The same way I shall keep cutting my bread with a knife. I can understand peoples’ positions re torrenting. I used to average one trip to the cinema per week, but prices have gone up considerably (35-40%) where I live, and that adds up. For some people, going to the cinema has changed, from being a good venue to see films, to being a special social outing that can only be afforded once in a while. (By ‘some people’, I mean ‘people who aren’t rich’). I don’t torrent films (on principle), so now I just don’t see films at the cinema much any more – supporting film has resulted in me not supporting film!! Ah, the irony. I live in China. I have no choice but to torrent. Then you should come to the West and pay for your sins repeatedly in the nearest multiplex. 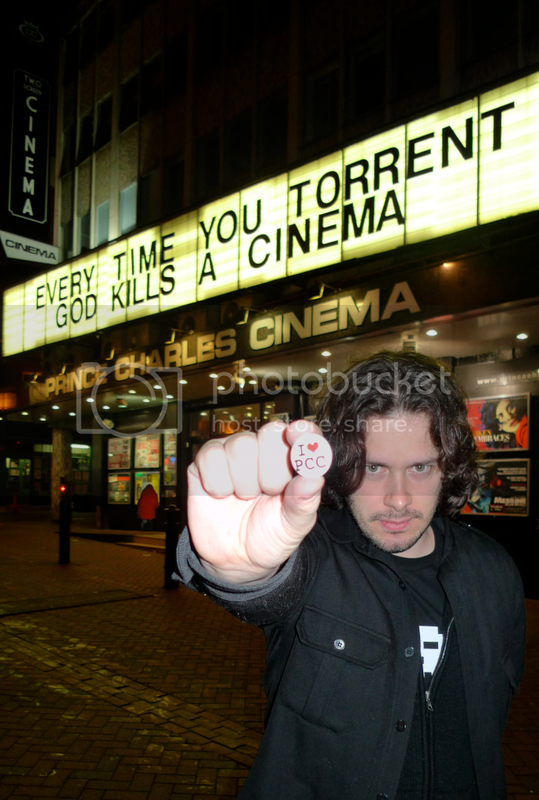 Given the horrendous cinema going experience these days, I say KEEP TORRENTING. I would write CARRY ON TORRENTING as a screenplay. Saw that earlier and was shamed by it as I’ve torrented. My only excuse is that I was made redundant a year ago this week and my dole money stopped in August. The only way for me to see some films right now is via torrenting. Still, shameful, to say the least. Hopefully I’ll be back to Netflixing and cinema going soon. no Slick – it’s behind you…! I SO wanted that to have genuinely been there. I swear I would stop downloading movies if there was a cinema in my town but there’s only a UGC and it actually feels good not to give them money. If so, I applaud you even more. Brilliant! The Brits have the word “Cinema” in 4 different fonts~.